This Sunday a week ago, the annual members’ meeting of the Museum of Connecticut Glass was held at the Manchester Connecticut Historical Society. One of the highlights was an outstanding presentation by Tom Haunton on 20th Century South Jersey Glass. Picture of Dana’s Pitkins at the MOCG Meeting, Manchester History Center. 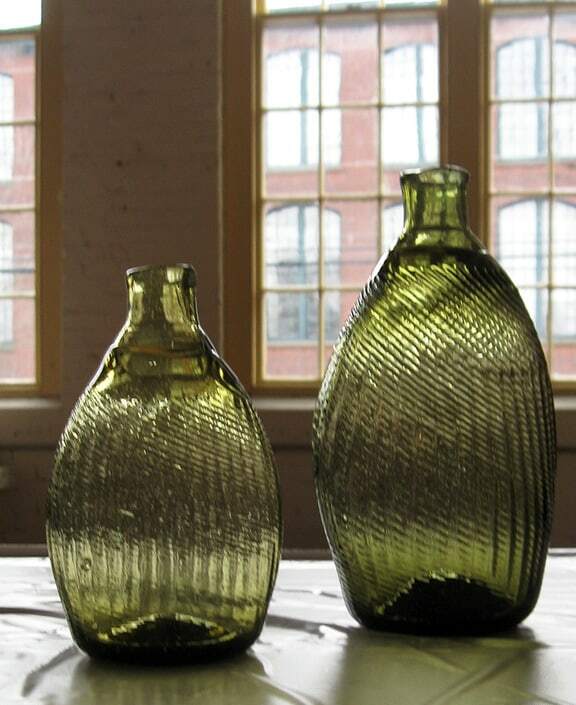 “The annual meetings of the Museum of Connecticut Glass are enjoyable for me for a variety of reasons…Manchester was home to Pitkin Glass Works and as a collector of Pitkin-type flasks, I bring a flask or two with me to the meetings for show & tell. 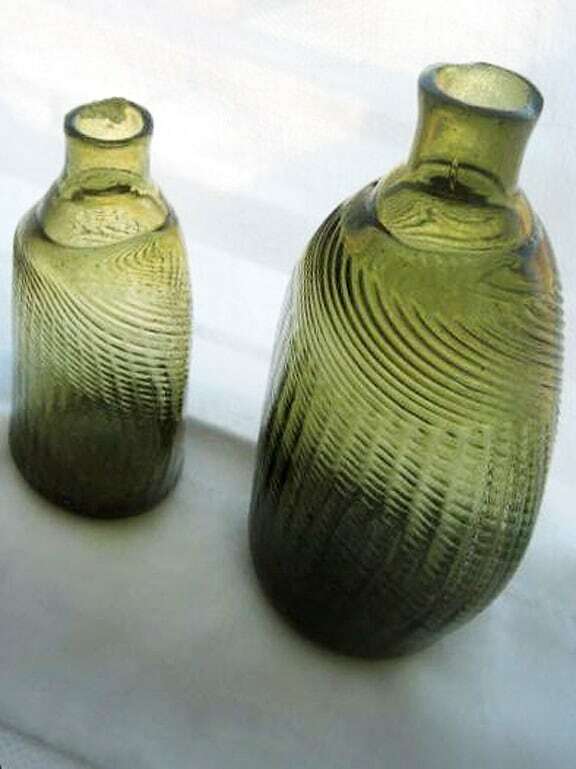 Recently, when Pitkin Glass Works expert Tom Duff and I spoke by phone, I asked his thoughts on an unusual form of Pitkin — I call these “knife-edged” Pitkins, because the side edges of the flasks are flattened, bringing them to a near point. Although it’s hard to know what New England factory they were blown in, every example that I’ve seen is crafted with great skill, well blown in the pattern mold to give good definition to both fine swirls and ribs, and the glass itself has good clarity. There are few enough Pitkin flasks of this form known that I theorize they might have been blown by one glassblower. Indeed, collectors who have examples refer to them as made by “that guy”. Tom was intrigued by the form and we discussed the possible reasons for forming the edges of the flask this way. Possibly it was to make it easier to get a grip on the flask when drinking from it, or it was the way the apprentice pinched the sides carrying it to the annealing oven, or it could have been, my favorite theory, that it was the personal style of “that guy”! Dana also provided another picture that better illustrates the “knife-edge” or flattened edge, with a second form for comparison.